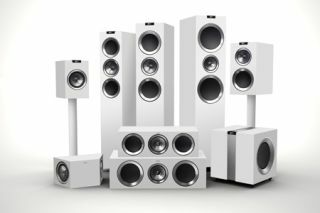 KEF adds white finish to R Series speakers | What Hi-Fi? KEF has added a white gloss finish to its new R Series of hi-fi and home cinema speakers, which are also available in gloss black and rosewood or walnut real wood veneers. There are nine models in the range, priced from £600 for the entry-level R100 bookshelf speaker up to £2750 for the R900 floorstander. All feature new Uni-Q driver arrays combined with improved bass drivers. Check out the full range in our previous news story. We'll be publishing a review of the KEF R100 in our August issue, on sale from June 29th.